Even within the 25-year history of The Legend of Zelda games, many people remember The Legend of Zelda: Ocarina of Time as something special. I’m one of them. About the time we were finishing up Super Smash Bros.14, I happened to be in Kyoto and I remember taking a retail copy home with me in a state of excitement on the 21st of November. 14Super Smash Bros. An action-fighting game released for the Nintendo 64 system in Japan in January 1999. 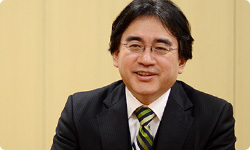 It was developed by HAL Laboratory, Inc. where Satoru Iwata was president. I was at HAL Laboratory then, but when I played Ocarina of Time, I was surprised. Of course, Super Mario 64 was surprising too, but Ocarina of Time showed me a lot that I had never encountered in any previous video game. This is something I used to talk about in interviews back then, but I had a solid feeling that we were able to portray something like warmth, scent and humidity in this game. You’re able to sense a certain atmosphere. Something that I said in “Asking Mr. Miyamoto Right Before Release” - one of our sessions of “Iwata Asks” about the Nintendo 3DS system - was how this was the first video game that could make you feel weak in the knees when looking down from a high place, like when you jump into the waterfall. Right. (laughs) I thought of auto jump on one of my days off. I couldn’t wait to get to work on Monday! Right! (laughs) I gathered everyone on Monday morning and said, “We’re going to do something called auto jump!” Everyone’s response was, “What? 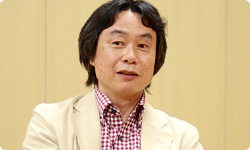 !” The team that had made Mario games was going to give up the jump button. Then you were able to automatically jump over a hole in the road without even pressing a button. Right. An added benefit was that we could program the pose Link would assume after jumping. We could look at the landform ahead and determine how Link would jump. That’s right. I thought, “If we use auto jump, then we can do all kinds of things.” Thinking of so many new things after that was fun. It really was a game with a high concentration of new discoveries. Z Targeting15 is another example. 15Z Targeting: When the player presses the Z Button, not only does the viewpoint shift to a view from directly behind Link, but Link can also talk with characters at a distance and gain an advantage in battle by locking on to enemies. In The Legend of Zelda: Ocarina of Time 3D, players press the L Button. Osawa-san and Koizumi-san said they made all kinds of discoveries related to Z Targeting when they went to Toei Kyoto Studio Park.16 16Toei Kyoto Studio Park: Part of Toei's film studios in Kyoto open to the public as a theme park where visitors can see period drama sets and shows. Oh, they talked about that too? I didn’t go though. They saw a sword-fighting show, and Koizumi-san noticed how even when one person was fighting against many, his opponents would attack in order, and that proved useful in making battles against multiple opponents. And Osawa-san was watching a show with a kusarigama (sickle-and-chain) and came up with the idea of establishing an invisible kusarigama in-between Link and opponents. In other words, you move in an arc with reference to your opponent, swing around behind and attack. (laughs) But the idea was to make a chanbara-style The Legend of Zelda game. Yeah. (laughs) How did you feel when Ocarina of Time was done? In terms of having done new things with this game, I had a very strong feeling that I only feel on a certain number of games that I’m involved in. And I was really happy that we here in Japan could make a medieval tale of sword and sorcery liked by the people of the world. Despite using a historical drama at Toei Kyoto Studio Park as reference! (laughs) It was received well overseas. Was it at the E3 in 1999 that Ocarina of Time won so many awards?17 You were going up and down the stairs to the stage accepting awards in all sorts of categories. 17So many awards: At the Interactive Achievement Awards held the same time as E3 in 1999, The Legend of Zelda: Ocarina of Time won in six categories, including Game of the Year. Oh, that’s right. I was a little embarrassed. Why do you think the game was evaluated so highly? At that time, the marketing team in America called it an “epic adventure”. Epic, as in old epic poems. That, too, is characteristic of the Zelda series. You mean in The Legend of Zelda: Skyward Sword?18 18The Legend of Zelda: Skyward Sword: An action-adventure game scheduled for release for the Wii console sometime in 2011. I’ll be sure to ask about that when the time comes.